Black Friday gets a lot of attention, but it’s more than just the crazy deals that will draw a consumer to a particular brand for the long haul. Content marketers can take advantage of the holiday cheer and create content that drives not only purchases, but also brand loyalty. Here are some companies that are doing it right. Both retailers have a core audience—outdoor enthusiasts—and they’re encouraging brand loyalty instead of immediate sales by eschewing consumerism, particularly around the holidays. Patagonia was out there first with the message. During the 2013 holiday season, they began their Worn Wear campaign to encourage people to repair their outdoor gear, rather than buy new items. Not only did it not affect sales, but the focus on the company’s values encouraged brand loyalty. Patagonia’s unconventional messages—from their “Don’t Buy This Jacket” ad after Black Friday 2011 to the “Worn Wear” effort, where they’ve traveled the nation in a bio-fueled camper fixing people’s worn Patagonia gear on the spot—have engendered the brand to this younger audience. And by the way, such efforts haven’t put a damper on the company’s growing sales figures. Patagonia does a masterful job of content marketing overall, but with this effort tells a great brand story of how durable its goods are and highlights a sustainability message that you don’t have to continually buy new clothing and equipment. The company even offers tips for how to fix its products. That may seem counterintuitive if you’re trying to boost sales, but it resonates with Patagonia’s core customers. Their customers already treasure the environment, so it isn’t hard to see why a message of reducing wastefulness would resonate. Patagonia also tells the personal stories of consumers in a compelling way. I dare you not to get sucked into this Worn Wear documentary, featuring stories of Patagonia loyalists and their well-used gear, with the product serving as a symbol of their lives outdoors. The Worn Wear blog also encourages people to share their stories, with the first being told by the founder of the company. REI is making a similar play this year with its #OptOutside campaign. This taps another anti-consumer feeling: the opening of stores on Thanksgiving and the insanity of Black Friday. With #OptOutside, REI will close its 143 retail outlets on Black Friday and will not fulfill online orders until Saturday. It is encouraging shoppers and its employees to spend Black Friday outside, a move I suspect will inevitably drive more people—particularly their core customers—into REI stores throughout the holiday season. This shows an understanding of who their customers are and what they value. The digital content surrounding #OptOutside focuses on what you’ll be doing instead of shopping, which feels right for the campaign and the brand. 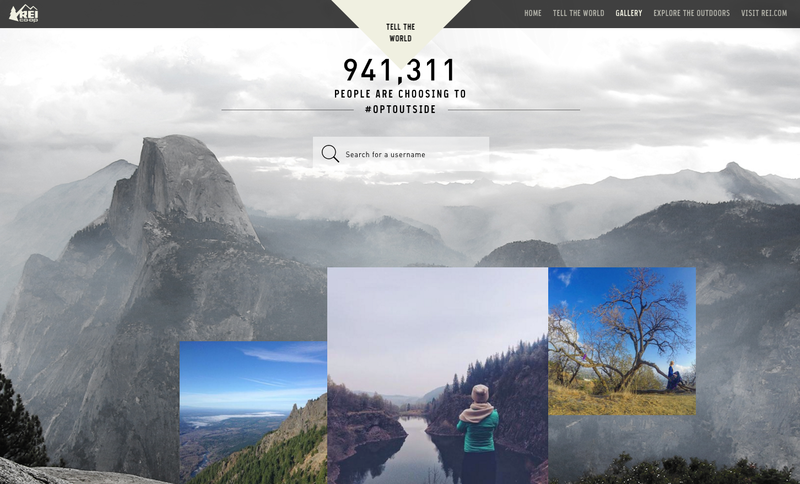 You can share your decision to #OptOutside through their site using their photos or your own. There’s also the option to search for places where you can explore the outdoors near you and submit your photos. The content is pretty simple and relies on others to spread the word on social, but it achieves its intended goal: encouraging people to just get outside. However, I suspect REI will further capitalize on the event during and after Black Friday with additional content. Every family has holiday traditions and for many that includes the Hess Toy Truck. Not familiar with it? Every year since 1964, Hess Corp. has produced a toy tanker truck (or jet, helicopter, fire engine or race car, depending on the year) bearing the Hess logo. They’re manufactured in a limited amount, and up until recently, were sold only at Hess gas stations. Hess sold its retail gas division in 2014 to Marathon Petroleum, although Hess Corp. still exists and is a major energy company. But the Hess truck remains and now can be bought online and at 10 mall locations in the New York metro area. The continuation of this tradition is a great way for Hess to remain a household name. For content marketers, this is an example of how to take advantage of your company’s history. People feel a real connection with the Hess truck. They remember the gas stations and they remember getting the toy as a gift, in some cases year after year and sparking a collection. Many people have also been able to replicate that feeling by giving their own children the Hess truck as a gift. That connection can be hard to come by for brands, but Hess is continuing to reap the benefits. 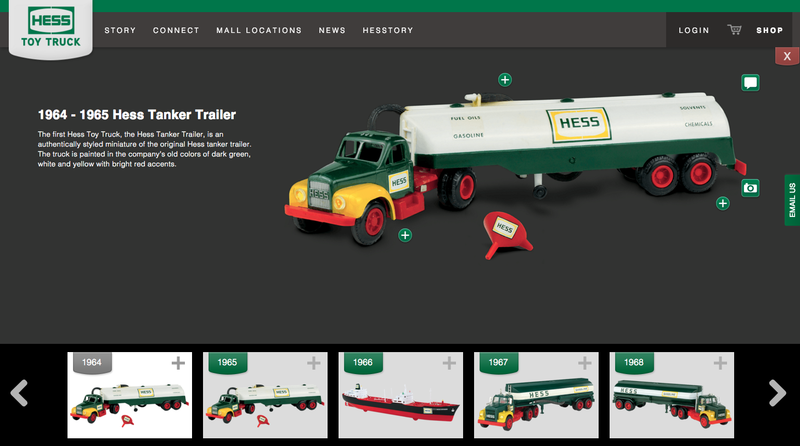 Hess has created its own website for the Hess Toy Truck, sharing the history of the toy (cleverly called “Hesstory”), how it’s made and, of course, how you can buy it. The site could be more robust. But all the basic elements of content marketing are there—the story of the product, photos, links to social accounts, and comments from happy customers who incorporate Hess as part of their holiday. Hess even has an app where you can maneuver a Hess Space Cruiser through an asteroid field. There’s also a recently launched blog that promises new and interesting stories about Hess history and its fans. On social, they highlight their Fan of the Month and regularly post cute photos on Instagram. That’s a good way to stay in the public consciousness year-round, not just at the holidays. You may remember this video from WestJet in 2013 that instantly went insanely viral. In the ultimate Secret Santa move, the Canadian airline’s employees asked passengers just before take-off what they wanted for Christmas. Shortly after they arrived at their destination, their wrapped requests of Santa appeared on the baggage carousel. The work it took to pull it off was astronomical. WestJet employees had to scramble to purchase and wrap gifts for 250 passengers while the flight was en route. Then there was the actual effort to film it all—19 hidden cameras had to be installed! The result was moving and showcased WestJet as an airline that cared about its passengers. The video was so popular because it featured real people and their very real reactions to genuine, unexpected kindness. It reminds us of the true meaning of the holidays—that it is better to give gifts than to receive them. Unless you’re the Grinch, how could you not tear up seeing the emotional response of the passenger who received a camera, or smile at the sheer joy expressed by the boy when he opened his tablet? For content marketers, this is an example of how authenticity in the holiday season can drive sales in the long run. WestJet not only engendered a ton of goodwill with this touching event, but also got results. The airline had a coordinated social media campaign on Facebook and Twitter, and social impressions were off the charts—the 2013 video has more than 42.5 million views to date on YouTube. The day after the WestJet Christmas Miracle launched it was the No. 1 trending topic on Twitter globally and garnered 1 billion Twitter impressions in just a month. While social awareness is great, WestJet says the campaign also boosted the bottom line. The company reports traffic on its site rose 100 percent compared to the same period the previous year. Bookings went up 77 percent and revenue increased 86 percent. While there could have been other factors that contributed to that, the brand awareness and good feeling associated with WestJet thanks to the video is truly priceless and something that lasts well beyond the holiday season. WestJet followed up in 2014 with gifts that perhaps have even more meaning. It sent WestJetters to the Dominican Republic, to a struggling area of the country that the company had done charitable work in previously. The airline fulfilled the gift requests, many of which were much more basic than a new television or tablet. WestJet hadn’t posted anything for 2015 just yet, but we’ll be curious to see if they can top their previous efforts. So remember—Black Friday is just one day. The good tidings and cheer that brands can generate with the right content marketing efforts can be a gift that lasts all year.